Nirman spearheads NMC’s distribution business, NMC Trading, one of UAE’s largest distribution companies across pharmaceuticals, medical equipment, consumables, personal care, food and beverage, household care, education and veterinary products. NMC is the exclusive distributor for Nivea (Beiersdorf), Pfizer, Nestle and Wyeth Infant Nutrition, Unilever, Sanofi, Medtronic, 3M Healthcare and Consumer, Siemens, Abbott, Welch Allyn, Neopharma and Kiwi among many others. NMC Trading employs over 1,700 people across sales, marketing, merchandizing, analytics and logistics. It serves over 10,000 points of sales across supermarkets, hospitals, groceries, pharmacies, schools, medical centers, stables, pet stores and gas stations. Nirman spearheaded NMC’s foray into e-commerce as well. In the past, as President – Corporate Affairs, Nirman was responsible for transforming the information technology, customer service and sales and marketing functions for NMC Healthcare. As UAE’s largest private healthcare provider, NMC’s 2,000 doctors treat over 12,000 patients every day. Nirman’s responsibility was to ensure that key components of the infrastructure that supports NMC’s clinicians were in place and constantly improving. 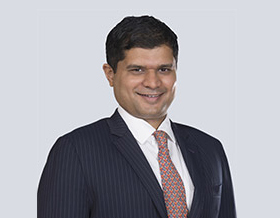 Prior to NMC, Nirman has worked at Lodha Developers, one of India’s leading real estate development companies, as a Senior Strategist and at Microsoft, one of the world leaders in information technology, as a Program Manager. Nirman is a bachelor of engineering in computer science from the RV College of Engineering, Bangalore and a master of business administration from the Indian School of Business (ISB), Hyderabad.